EDvance Director Lygia Stebbing (back row, second from left) with SF State students, muralist Libre Gutierrez (back row, center) and Vrygrond community members. Vrygrond Township in Cape Town, South Africa isn’t exactly a tourist trap. The economically challenged community lacks basic services such as fresh water and sewage treatment and has been plagued by gang violence. Yet each summer, you’ll find students from San Francisco State University there. They aren’t searching for typical school break fun in the sun. They’re looking for opportunities to learn and help. And they’ve found them. Every June for the past five years, a dozen students and staff from San Francisco State’s Department of Child & Adolescent Development (CAD), Early Childhood Special Education and EDvance programs have boarded a plane, some for the first time, and flown to South Africa as part of CAD’s honors program. Led by Lygia Stebbing, director of EDvance (an early childhood teacher preparation program in SF State’s Marian Wright Edelman Institute), the group spends eight weeks partnering with early childhood educators in Vrygrond. They learn Afrocentric curriculum practices and share methods for reinforcing good behavior with local teachers. 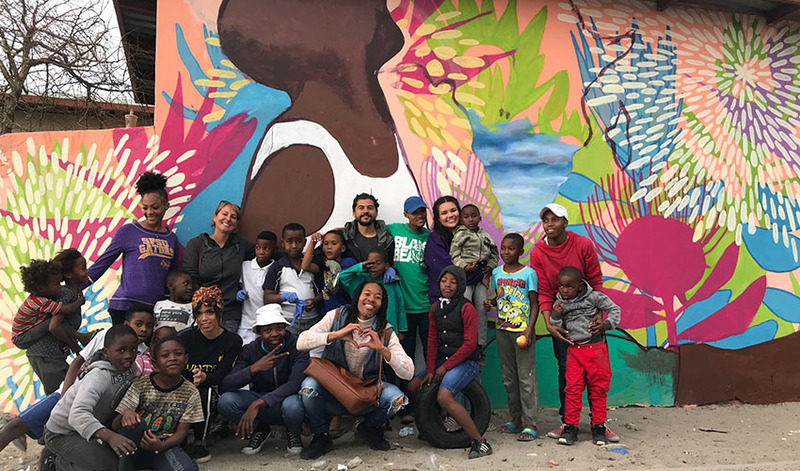 This year, one of the brightest spots of the program was a community mural that the students, teachers and community members completed in honor of Mandela Day, an international celebration of South African leader Nelson Mandela. Mexican muralist Libre Gutierrez volunteered to join the SF State contingent this year to lead people of all ages in painting the vibrant mural, which depicts native people, plants and wildlife. “On Mandela Day, you do 67 minutes of service for the 67 years Nelson Mandela spent fighting for social justice,” said Stebbing. But the SF State students spent much more than 67 minutes, sacrificing planned weekend trips to help finish the mural by working sunup to sundown. The mural became a beloved place of healing and unity, Stebbing said. The students bring home songs they’ve learned in various African languages as well as dances and stories, which they share with the preschool children they work with here in San Francisco. But the partnerships the students form with teachers and community members last far beyond the eight-week trip.